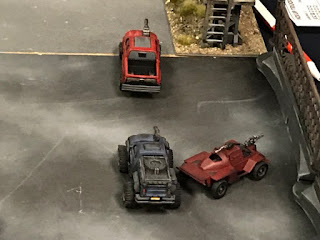 Fawcett Avenue Conscripts: GASLANDS at Legions Maxximus! 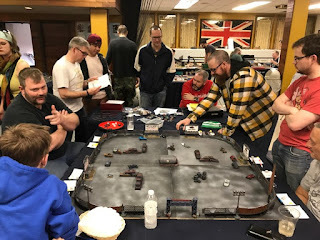 One of our usual Conscript activities is running games at local tabletop wargaming conventions (or "shows" for our UK readers). This year is no exception as Conscripts Greg, Dave and I ran games at the recent "Legions Maxximus" show. 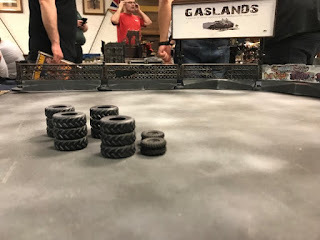 This time out I ran a game of one of our new favourites, GASLANDS. 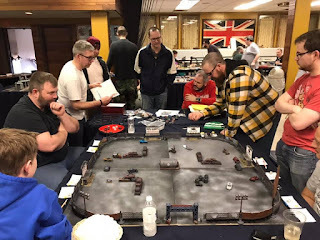 I've blogged about the game before, but suffice to say that this game of vehicular combat and mayhem is some of the most fun we've had in awhile. It's super-easy to design your cars, the rules are fast-paced and straightforward without being simplistic, and best of all, the barrier to entry on the model side is very low - the game is designed for regular Hot Wheels and Matchbox toy cars, albeit converted with armor and GUNZ!!! 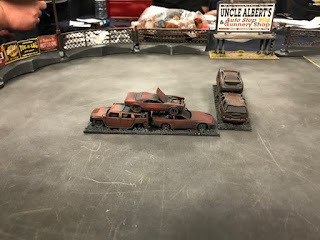 I set up a standard arena battle using my Disney Pixar "Cars" fence sets and billboards from TTCombat. Six players joined the game (including a charming father-son duo) and we were off! As the Duke of Wellington famously quipped, "The history of a battle, is not unlike the history of a ball. Some individuals may recollect all the little events of which the great result is the battle won or lost, but no individual can recollect the order in which, or the exact moment at which, they occurred, which makes all the difference as to their value or importance." 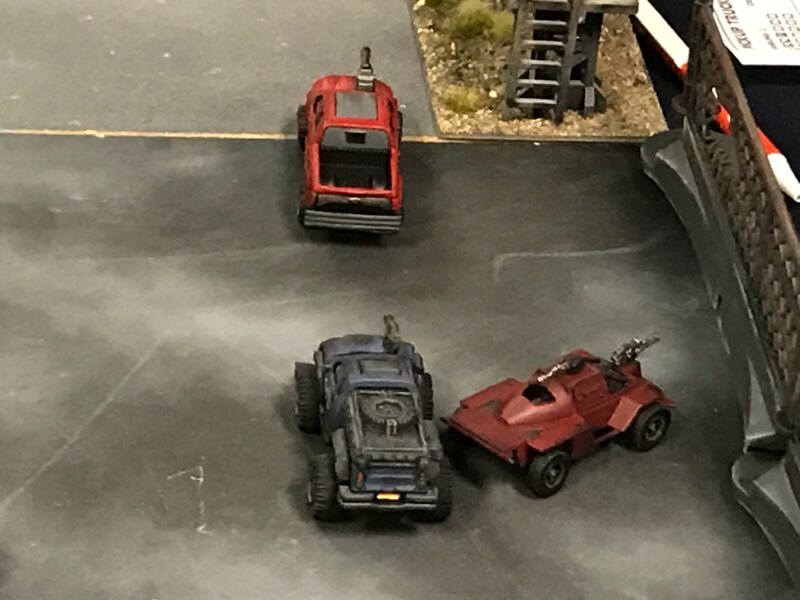 So it goes with a game of Gaslands. I won't even try to describe it! 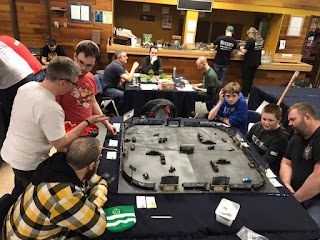 I think everyone had a good time (they said they did anyway) and the game provided me (the GM) some good learnings for next time I run it at a convention - that will be at Prairiecon in June. Looking forward to it! The Gaslands game looks ace, great board! This was a great game dude - the terrain, everything, a lot of fun, and clearly a huge hit at the event! 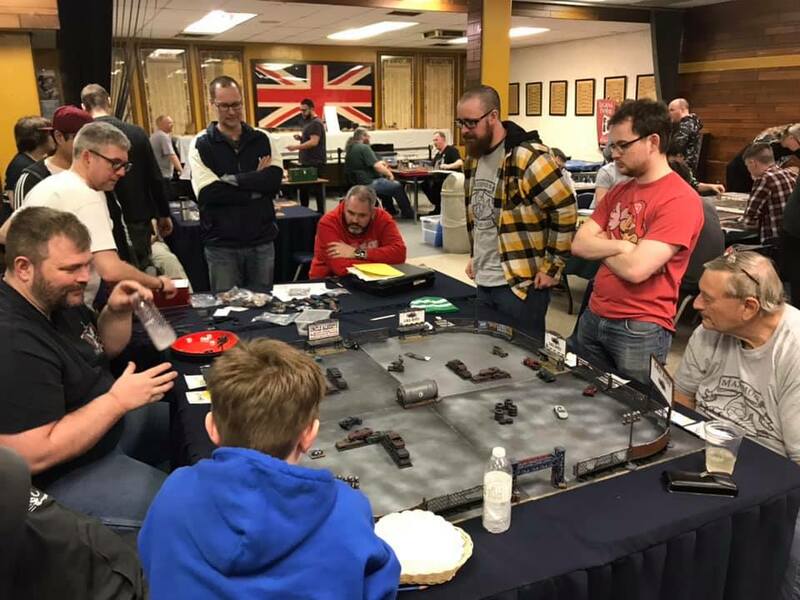 Looking forward to seeing it at Prairiecon!